In a break from my normal tech reviews, he’s a review for the average Joe. Before we left for New York, I emptied many items from my wallet and saw that cards became much looser, so I had to rearrange things a bit. While we were in New York (as seems to happen in most cities we visit), there was a street market with people selling all kinds of junk. We passed a few places selling wallets, but I couldn’t justify spending $10 on a cheap wallet when I had only paid $15 for my wallet at Mervyn’s (RIP). , so we stopped. These wallets were different from the others we saw and my wife asked if the cards would fall out when there were fewer cards in it. The vendor said no and turned a sample wallet upside down. That was only the icing on the cake. He also had a comparison with a normal, leather wallet and the thickness difference was stunning. I asked the cost and he said $20. I was sold. My wife reminded me that I balked at $10, but jumped at $20. Oh well, the salesman was pretty good. I’ve now had the wallet for about a week and a half now and I keep thinking I’m going to lose it because all my back pockets are stretched to fit my old leather wallet! While the salesman was good, I was a bit cautious in my enthusiasm when I bought it. 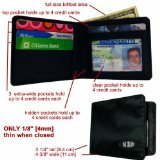 Well, so far, I’d buy one of these wallets again without hesitation (provided it holds up). I have absolutely no complaints with this wallet. Every time I pick it up, I’m amazed at how thin it is. I’m hoping that it lasts; all other reviews I’ve read have also given it high marks. As some of you may have noticed, I’ve started writing more reviews of products. While I’m not a huge fan of reviews that some people review (I don’t believe their unbiased or fair), I’ll let my readers be the judge of the value of my reviews. For the most part, people don’t send me products nor ask me to review software. These reviews are for products that I purchase; I do my own research and, of course, read other reviews before purchasing products. If you have any questions about what I review, please ask and I’ll do my best to answer them. I’m quite critical of products as I don’t like wasting my hard earned money. If you like my reviews, please use the Amazon link on the right to make purchases. If you think I own a product that you’d like reviewed, please let me know. I don’t review everything I own as I’d bore myself. If you have a product you want me to review and aren’t afraid of my honest feedback, contact me and I’d be more than happy to review it. It was fairly inexpensive from Amazon, but based on the reviews, I had high hopes for the little box. My only hesitation in getting any amplifier is that a cable tech had told me years ago that an amplifier put inline before my cable modem could cause problems. I received the amplifier about a week and a half ago and quickly plugged it in. EyeTV reported I had a signal strength of between 30 and 32%! That is about a 50% increase in signal strength; I had hoped for more, but that was a decent increase. So far, I have not had one recording that has been blocky and the EyeTV has been working quite well. If you have to split a coax signal, I’d definitely recommend one of these. If you don’t have to split a coax signal and are having problems, this box is definitely worth a shot. However, as someone pointed out in a comment in another post, terminate all the ports that aren’t in use. In my case, all 4 ports are in use, so I didn’t have to terminate any ports. remote. I had a Harmony 520 remote before and wasn’t all that impressed with it, but it has been a few years, so I decided to give it another try. With my new media center and TV, I now have 4 remotes to deal with everything, so life is much more complicated. Prior to my new TV and media center, my TiVo remote controlled the TV and TiVo, so I wasn’t used to multiple remotes. When I first started configuring the remote, I saw the awful desktop software that hadn’t really improved since the 520 I had before. After a lot of work, I managed to get the “Devices” configured and things seemed to work. Where I really got confused was the activities; I just wanted to replace multiple remotes with one and switch between them. After more beating my head against the computer, I finally grasped the “activities”. For me, the activities are pretty simple, Watch TV, Watch EyeTV, Watch TiVo. I wanted to use the TV volume and have the rest of the controls work for the TiVo or EyeTV. In my first full day of testing, I can say that everything is almost working, but I’ve had to tweak the settings a half dozen times. Time will tell if this will work out for me and be a true replacement for the jumble of remotes. After I’m satisfied with it, the next test will be to see if my wife will accept the remote. She’s very reluctant to change and I still haven’t had her “run” the EyeTV. Great physical feel; reminds me of the TiVo remote. Pretty much can be configured to work with any device. Desktop software is horrendous to use. It tries to walk you through everything which makes it cumbersome. Furthermore, it is some type of web app and really only a shell. I’m not quite used to the keys; they don’t quite map to my remotes so I have to use the “soft keys”. Tweaking controls takes time. For instance, each time I hit one key for the EyeTV, it sent the command twice. I had to walk through the help to fix it. Concept of activities is hard for me to grasp. The jury is still out; since I bought it from Costco and it isn’t a TV/MP3 player, etc. I can return it when I’m done evaluating it and it doesn’t have to be within 90 days. I’m going to keep working with it and see if I can work through the quirks as it is highly configurable. As I wrote before, the options for having 1 DVR that records analog cable and clear QAM channels are quite limited. The EyeTV handles this, so it is a huge plus for it. The first thing I noticed after installing the EyeTV is that it isn’t a TiVo. Well, duh, it isn’t made by TiVo. The way I look at it, the TiVo is the gold standard in DVRs as the interface is easy to use, has Season Passes to record all episodes of a show and can be configured from a remote control. The EyeTV is a computer program and easiest way I’ve found to do the scheduling is to use Apple Remote Desktop to connect to the machine and use the program guide instead of being able to use the remote. It took me awhile to figure out how to effectively use the remote control and on screen menus and last night was the first time I watched TV (I’ve had it for about a week now) using just the remote control and not using my MackBook Pro to control it. The quality is quite good and the on screen menus can be negotiated fairly easily (not as easily as the TiVo, however. Now that I’ve realized the limitation of the programming, I think I can live with it. However, it won’t pass the wife test; I’ll have to do the programming and show my wife how to view the recordings. Ability to use an existing Mac to use as a DVR. Easy to add drive space for expansion (add an external hard drive). Free TV Guide guide data for a year. Ability to add commercial skipping (in recordings) using etv-comskip. This may be the killer feature of the EyeTV. In my testing, this has worked most of the time. Recordings can be shared to other machines if they have EyeTV installed, or if they are exported to AppleTV and added to iTunes, or if they are exported to iPhone format and viewed over the web. I haven’t figured out how to remotely schedule clear QAM channels. Scheduling has to be done from a remote computer. A web interface (advertised via Bonjour) would be ideal. On screen menus need work as there are far too many clicks to do anything. Take a look at the TiVo. On screen menus seem slow. Remote control is a piece of junk. It is far too light (in weight) and the buttons aren’t labelled to reflect what they do. I’ve had to look at the manual a few times and play around with it to figure out how to use it. More needs to be done to allow full control via the remote control if El Gato wants to hits the media center market. Toast Basic which is included is a waste as the only goal is to upsell you and while it is nice to have some kind of recording software, I don’t like getting slapped with “you can’t do this unless you upgrade”. El Gato might have been able to strike a better deal with Disco or just build in basic disc burning themselves. Mac OS X includes APIs for burning DVDs. I haven’t found an option to automatically delete recordings after x days or when disc space gets slow. No option to say how much disc space you want to devote to recordings. No ability to stream live TV to other machines. If recordings are shared for AppleTV (to share over iTunes), they have to be manually removed. I have a love/hate relationship with this product so far. I like being able to record HD and non-HD content using my setup without having to purchase more content. In addition, I like the commercial skipping (via open source software). The scheduling, however, is the biggest downside to making this a true TiVo replacement. In addition, the on screen menus need a lot of work. I’m definitely going to keep this and learn to use it more. However, I can’t whole heartedly recommend the EyeTV. It isn’t a product for the novice and won’t pass the wife test in ease of use. Some of the export options may make it more useful as I have a few trips coming up. I’ll post updates as I learn more and possibly as the software gets updated. 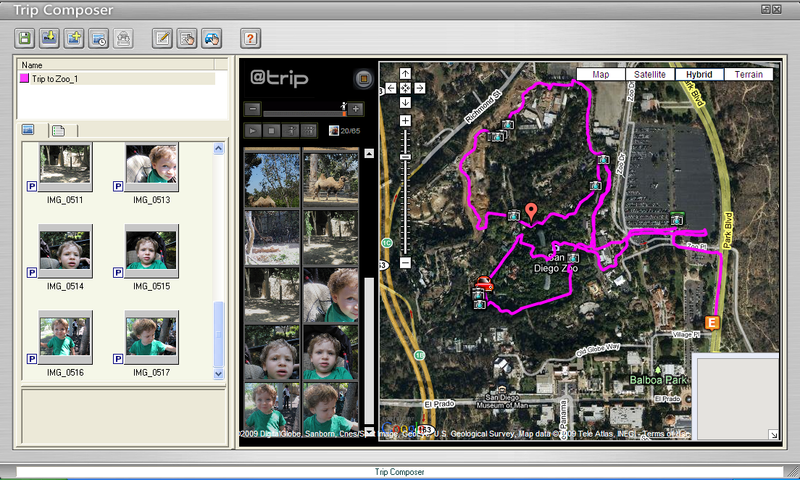 As part of reviewing the i-Got-U GT-120, I searched for a Mac solution to handle geotagging of photos. There are lots of options on the Mac. I looked at many of them and GPSPhotoLinker worked quite well and was free to top it off. In addition, the interface was very Mac like. I liked what I saw, so I asked the developer for a copy of PhotoLinker, GPSPhotoLinker’s big brother, to review. GPSPhotoLinker and PhotoLinker share a main purpose and that is to geotag photos. In both programs, you load in your track files. (Hint, create a folder on your hard drive and put all your track files there and keep them so that you can reference them later. Both programs link to the files and don’t copy them.) Both programs do their basic job well in that you load your tracks and pictures and basically click “geotag”. If all you need is geotagging, then I have to recommend the free GPSPhotoLinker as it worked well in my testing. PhotoLinker starts adding bells and whistles that may make it worth $50 to prosumer or professional photographers. Cleaner interface. 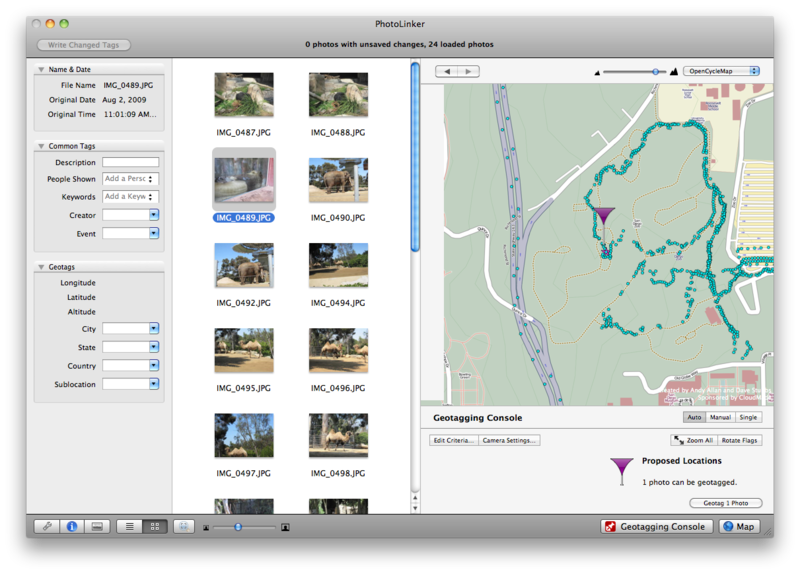 The basic PhotoLinker view puts the geotagging console hidden so that what you see are your pictures, a map, and tags associated with the picture. GPSPhotoLinker confuses the interface by having the first column be the area to geotag. Ability to add EXIF tags outside of the standard geotagging information such as keywords, description, people shown, and event. More customization in view options. I put both products through some tests and the rest of this review will focus on the paid PhotoLinker product. Clean user interface; very Mac like. There isn’t a lot to say as it does what it is supposed to do and does it simply. Map choices aren’t all that useful; Google and the more mainstream maps aren’t options. The developer has indicated on his forums that this is due to licensing costs with the mainstream vendors. No AppleScript support. Normally I wouldn’t care, but when my end goal is to get geotagged files into iPhoto, automation would be most welcome. I really like the concept of geotagging my photos. I don’t travel all that much, but anticipate taking vacations in the future with my family (have you ever travelled with a 2 year old? It isn’t the most pleasant experience.) For basic geotagging needs, the free GPSPhotoLinker will handle all my needs. I can’t justify the $50 for PhotoLinker for a few user interface improvements. I don’t see myself using additional EXIF tagging, so that feature isn’t a key to me. PhotoLinker will have to add some real compelling features to justify the cost; I can’t think of any features right now, so I’m not much help to the developer. I’d be more than happy to take another look at PhotoLinker when improvements are made to see if my recommendation against buying stands. A few months ago, I got a Sprint MiFi 2200 to test and use for work. When I first saw this device at CTIA Wireless back in April, my jaw just dropped because of the size and utility of the device. In case you don’t know what it is, it is a mobile WiFi hotspot. For a number of years, I’ve written drivers/applications for various USB modems. While USB modems do have many uses, the lack of drivers drew me to the MiFi. The quality of drivers/applications ranges from good (the ones that are built into the OS are best) to not so good, so by eliminating the drivers, my main complaint about modems goes away. I also really like the ability to connect more than one device to it when I’m in a situation with co-workers without a broadband connection. In addition, having the modem separate from the computer lets you put the modem next to a window and you can sit somewhere else in say a hotel room. This is huge when you have trouble getting a signal; you no longer have to have sit next to the window. Really my only complaint about the device is battery life; due to the small size, the battery doesn’t last as long as the battery on my Mac. For a consumer, the monthly cost could be a barrier. Overall, if you have a need for mobile broadband, I don’t think that you can go wrong with the MiFi. Today I finally bit the bullet and entered the world of HDTV. I bought a Vizio SV370XVT at Costco. 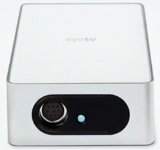 I did my research and decided on Vizio as it had features I wanted and got some decent reviews (some reviews have been mixed). This TV replaces my 7 year old Sony 32″. Last week we were at Costco and I had settled on getting the VL370M as that’s what they had in 37″. This week, they had the newer XVT model which was $120 more, but had TruVolume and a we other features. Like my father, you might ask why 37″? That question is quite easy to answer. 37″ is the largest TV that will fit in our entertainment center! It has doors that close over the TV which is important for us to signify the end of watching TV for the day for our son and doesn’t make the TV the focal point of the room. I plugged the TV in, hooked up the right cables (it does help to plug it in), went through the initial setup to scan for channels and presto, it worked. I started flipping through the channels and had already read that the -1 channels were HD channels, so I was excited to see what we got. My wife and parents were in the room as well and when I hit CBS or ABC HD showing golf, everyone at once ooed at the clarity of the picture. An HDMI input that also has stereo audio; this is necessary for my Mac media center as I have a DVI to HDMI cable for video and RCA left/right for audio. Very sharp picture; granted I haven’t had another HDTV in my house, so I don’t have a comparison. It’s very thin; the box says 2.2″. Wow, I had to make the hole in the back of the cabinet larger to fit the back of our old TV through it. I wish there was a second component input. I have a TiVo with component outputs and have cables for my Wii that output component. This may be a moot point soon when I move to a Mac based media center. While I’ve only played with my new TV a few hours, so far I’m quite pleased with it. Once I put together my Mac based media center, I’ll be able to give it a more thorough test drive. I know that some people will say that the Vizio is the bottom of the barrel HDTV, so I’ll just have to see how much I like it in 6 months. For the longest time, I said I didn’t care about HD, so maybe my standards are quite low. In a nutshell, you use this GPS unit along side your digital camera (it doesn’t connect to it) and then when you upload your pictures to your computer, you extract the GPS log from the device, and based on the timestamp of the picture, the photos are geotagged. Combined with iPhoto ’09, this is cool for people that travel and take pictures. While I don’t travel all that often, I think the concept is fantastic, so I was pleased that I was offered an evaluation unit. Prior to receiving the unit (I do get to keep it, but it won’t affect my review), I was informed that it was Windows only, so I’d have to use VMWare to test it. As a Mac user, using Windows is something I want to avoid at all costs. Of course, enterprising hackers have already reverse engineered most of the protocol and created a program that reads the data off the device and outputs a GPX file. 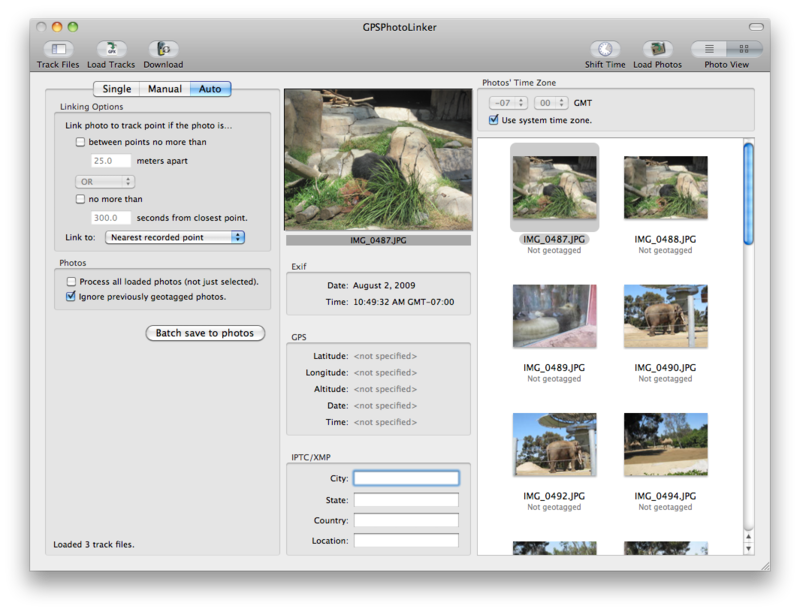 The GPX file can then be imported into a variety of geotagging software. I received the device yesterday and started playing around with it. The first thing I noticed is the size. I can easily wrap my hand around it and make a fist. It has one button on it that is used to turn the device on and off. It has 2 LEDs and that’s it for user interface. The package came with a mini-CD with the Windows software. I’m not sure what computers these days read the mini-CDs, but no laptop or desktop computer that has a slot loading drive can, so I downloaded the Windows software from their web site and installed it in VMWare. My first real test was on a trip to the zoo with my son. I turned it on and snapped some pictures around the zoo. I basically forgot about the device and was on my way. The hardware is pretty cool; the battery seems to last awhile. The battery charges over USB, so that’s convenient. My only complaint is that it uses a proprietary USB connector instead of mini or micro USB (I now have to carry another cable). I installed the software on Windows XP under VMWare and it worked fine talking to the device over USB. I imported my tracks and photos. I found the software a bit cumbersome. Editing waypoints just seemed awkward; I had trouble removing points that I didn’t want, but after a few tries figured out how to click on a point and see it on the map. It’s cool to see the Google map representing the track and seeing the photos on it, but the software just doesn’t seem easy to use. Maybe I’m used to Mac software and haven’t used much Windows software, but they must be able to do better. The output on their @trip web site works well. I didn’t see any option to export to my own site (I could have output it to Picassa or Flikr, but I like having a bit more control over my photos). Other reviews of GPS loggers indicate that the software is pretty weak as well. The developers should work with developers that specialize in writing software and just concentrate on the hardware. Since I’m a Mac user, using Windows software pretty much makes me want to poke out my eyes. There are a few Mac products out there that I’ll review at a later time. Even with the non-streamlined workflow, the Mac software options are so much better than this. I really like the concept of geotagging photos and the iGotU-120 seems to fit the bill. I’m disappointed that there isn’t a native Mac solution, but hackers have filled in the gap (the workflow isn’t all that clean, however). Would I buy the device if I had to? At $70, it’s a bit steep for me as a casual photographer. If I took more pictures, I think it would be worth it. For Mac users, you might want to invest in other geotagging applications.